Is Loft Sails always this quick in releasing racesail data, or is the 2010 just that good to publish it already right now? New sizes/ other aspect ratio. Blade 2010 mast lengths are shorter than the 2009s- some sails drop down a size for the mast rec. For example, the 09 6.8 morphs to a 7.0 for 2010. The 6.8 09 is best on a 460rdm, the 2010 7.0 rigs on a 430rdm. Photos Blade 7.0 2010 with a 100% carb 430 rdm. 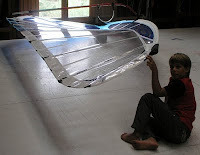 In the Netherlands I have noticed Loft Sails are competitive sails, good windsurfers go really fast with the sails. The 2009 had a nice more full belly, now the 2010 a smaller aspect ratio?!? All sound like good developments too me.